The saga of Tonya Harding and Nancy Kerrigan was perhaps the strangest, least expected sports story of the 1990s. Of all the sports to descend into that kind of violence, women's figure skating? Of course, it was actually Harding's ex-husband Jeff Gilooly and her ex-bodyguard who were responsible for the hit, but most people who remember these events tend to think of Harding as a whiny, white-trash villain. But the real story is more.complicated that than, and the real achievement of director Craig Gillespie's film is to make us empathize with Tonya and think of her as a person in a way we didn't before. 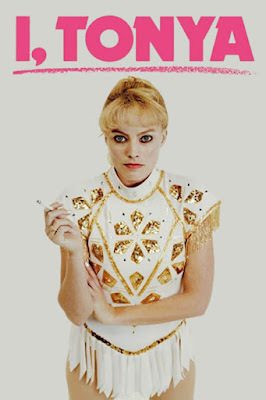 Margot Robbie, who most movie goers know as the only part of "Suicide Squad" that they liked, plays Tonya Harding beautifully, in a funny and touching performance that shows she's far more than just Hollywood's pretty face of the moment. In fact, one of the stretches of the role is that Robbie has to try to downplay her movie star to looks, as part of the premise is that Tonya Harding was disliked by the figure skating establishment for not fitting their Princess archetype. But this works far better than we might expect, and Robbie is well.deserving of the Oscar buzz she's getting, as is Allison Janney in a hilarious and heart-rending performance as Tonya's dysfunctional mother Lavonna Golden, one of the funniest awful people we've seen in a film in some time. Sebastian Stan is also very good as Gilooly, and Paul Walter Hauser is a scene-stealer as Shawn Eckart, the so-called bodyguard whose rich fantasy life attempts to cover his lack of a real one. If there's a character who is left underdeveloped it's Nancy Kerrigan, who is treated as more of a plot device than a character. But this is Tonya's story, not Nancy's. Screenwriter Steven Rogers (who is NOT Captain America) has done great work here, mixing biting satire with poignant drama. The film is structured as a mix between traditional narrative, mockumentary style interviews, and breaking the fourth wall and talking to the camera in a way that existed long before Ryan Reynolds ever did it so don't accuse it of ripping off Deadpool. If the film has weak spots, it's that the relatively low budget makes the Olympics seem smaller and less grand than they are, and that it over simplifies the dual nature of figure skating as both sport and art to make its point that Tonya Harding didn't get a fair shake. Its a point worth making, but the reality is that "presentation" in skating is about more than than creating a princessy image, it's about skating a fluid and refined program, and Tonya Harding struggled with that, as good a jumper as she was. But those issues aside, "I, Tonya" is a very good film, highlighted by excellent performances. It will make you reconsider your opinion of Harding, and whether you were fair to her back in the day. The fact it raises this question without giving a definitive answer is entirely a good thing.